With Boutique Blends’ Aging Room Pelo de Oro, there are a lot of things that are unique about this release. For starters, it is a collaboration that was done with A.J. Fernandez. It is also the first Aging Room branded cigar to be made in Nicaragua. The cigar itself is also the first Aging Room branded Nicaraguan puro by Boutique Blends. The filler of this blend is the differentiator as it is made up of the rare Pelo de Oro tobacco. This new cigar was officially launched at the 2016 IPCPR Trade Show. Aging Room Pelo de Oro is a small batch cigar because of the low yield of the Pelo de Oro tobacco. The low yield is because Pelo de Oro is susceptible to blue mold and other diseases. A.J. Fernandez was growing the tobacco on his farms and Boutique Blends was able to procure some for this release. The cigar comes in one size – a 5 1/2 x 55 Scherzo. Once again Boutique Blends uses a musical name for the vitola. In this case a Scherzo is a light musical composition, typically made up of a movement in a symphony. The cigars are packaged 10 per box and each cigar is priced around the $14 mark. For the packaging Boutique Blends President Rafael Nodal said he is utilizing a new printing system for the boxes as opposed to using paint. The collaboration with A.J. Fernandez is one of several by Boutique Blends. This year the company announced Oliveros All Stars, a collaboration with Ernesto Perez-Carrillo. Last year, the company teamed up with Altadis for the Romeo by Romeo y Julieta Aging Room Small Batch F25. In addition, the Swag and Aging Room brands have had an on-going collaboration with Jochy Blanco of Tabacalera Palma. 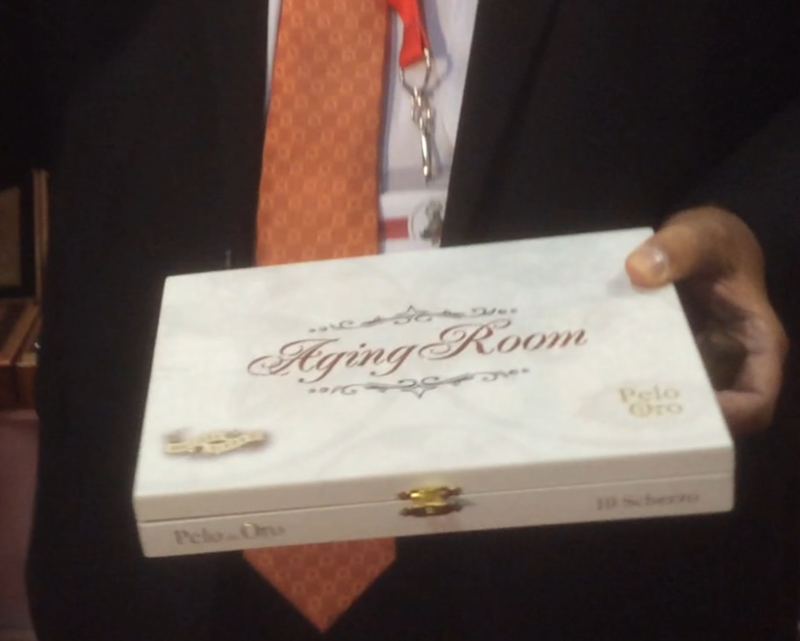 The Aging Room Pelo de Oro comes in one size – a 5 1/2 x 55 vitola known as Scherzo. You should check your data. Pelo de Oro is manufacture in Costa Rica using tobacco grown in Costa Rica. That is not entirely correct. Yes, there is a Pelo de Oro brand made out of Costa Rica by Felipe Gregorio, we covered it here. Pelo de Oro is a type of tobacco. It is used by many companies. My Father Cigars has made use of it, as has Aging Room for this brand, which also carries the name. You can also see that the name is used on the box in the photo validates that.